Spurs to the gallows in CL Group of Death! Chelsea face a fiery Champions League tie against Atletico Madrid in a devilish twist to the Diego Costa saga. 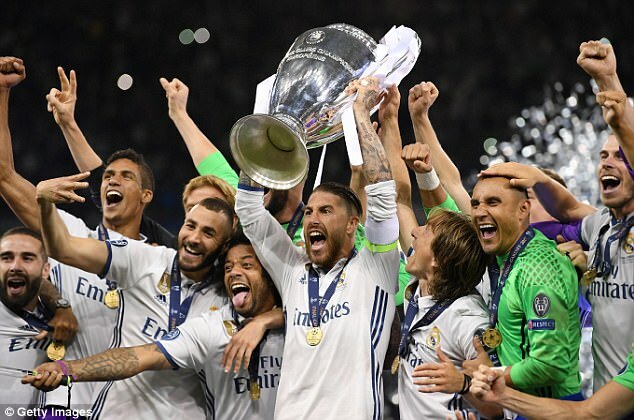 While Tottenham fared worst of the five Premier League clubs by being drawn in Group H with Real Madrid, Chelsea landed in Group C along with Atletico, Roma and Qarabag of Azerbaijan. It is a challenging pool for Antonio Conte’s Chelsea and the standout fixtures will see them face Atletico. Chelsea striker Costa is refusing to return from Brazil while demanding to be allowed to rejoin his former club in Madrid. It will add a dash of spice to the matches, though Costa — signed from Atletico for £32million in 2014 — would not be eligible to play even if a deal was agreed as the Spanish club must serve a transfer ban until January 1. Manchester United, Manchester City and Liverpool landed favourable draws but Tottenham face a huge challenge in Group H against champions Real Madrid, Borussia Dortmund and Apoel of Cyprus. It pits Spurs against Gareth Bale for the first time since his £86m move to Real in 2013 as well as a tie with Dortmund, who hammered Mauricio Pochettino’s side 5-1 on aggregate in the Europa League in 2016. Real, for their part, beat Tottenham 5-0 over two legs the last time they made it out of the group stage, in 2011. But they will be without Dele Alli for their first three games — including Real at the Bernabeu — after he was sent off in last season’s Europa League tie against Gent. Spurs striker Harry Kane said: ‘It’s a great draw. You expect to play the best in Europe in the Champions League. You want to test yourself against the best and Real are the best. United are in Group A after qualifying as Europa League winners. They face Benfica, whom they beat to win the European Cup in 1968. They also have a rematch with Basle, who caused a major upset by beating them in the group stage in 2011 when United crashed out of a group that also included Benfica. Perhaps the most challenging assignment for United manager Jose Mourinho will be the 3,000-mile round trip to Russia to face CSKA Moscow. 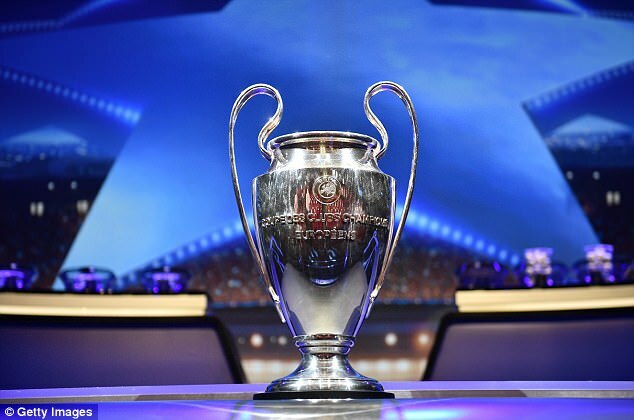 Manchester City go up against Shakhtar Donetsk, Napoli and Feyenoord in Group F, while Liverpool — who beat Hoffenheim in a play-off to reach this stage — face Spartak Moscow, Sevilla and Maribor of Slovenia in Group E.
United were in same group as Benfica and Basel in 2011-12… when they finished third and fell into the Europa League. WATCH OUT FOR: Alan Dzagoev – CSKA Moscow’s midfielder was joint-top scorer at Euro 2012 for Russia. DID YOU KNOW… United were last English club to have a top scorer. Cristiano Ronaldo got eight goals in 07-08 and they won it. A long trip to Azerbaijan to face Qarabag. But the trickier opponents in Group C will be Atletico Madrid and Roma. WATCH OUT FOR: Fernando Torres — Atletico’s ex-Chelsea striker. DID YOU KNOW… the last time an English club had a player in the Squad of the Season was Chelsea’s Branislav Ivanovic in 2014-15. Three beatable teams for City, who should progress. WATCH OUT FOR: Lorenzo Insigne — The Italy striker is being linked with Barcelona for a reason and is Napoli’s frontman. DID YOU KNOW… Guardiola had reached seven semi-finals in a row before he joined City, with whom he lost in the round of 16. It could have been a lot worse for Liverpool, ask Tottenham. WATCH OUT FOR: Jesus Navas — ex-Man City is now Sevilla captain. DID YOU KNOW… Liverpool’s last UCL goal was scored by Steven Gerrard in 2014 when they drew 1-1 against Basel and went out. Harry Kane looked on the bright side and tweeted: ‘Great draw! Some huge games in there.’ But boy, it’s tough. WATCH OUT FOR: Cristiano Ronaldo — who else? DID YOU KNOW… Spurs top scored in 2010-11 group stage (18). Celtic were given a dreadful draw against Bayern Munich in Group B, along with big-spending Paris Saint-Germain and Anderlecht. Barcelona will face Juventus in Group D.
As part of the draw ceremony in Monaco, Cristiano Ronaldo became the first player to win the UEFA Best Player in Europe award three times as gained the prize for the 2016-17 campaign. He beat Barcelona star Lionel Messi and Juventus goalkeeper Gianluigi Buffon, while Real team-mates Sergio Ramos and Luka Modric soon joined him as Defender of the Year and Midfielder of the Year. September 12: Benfica vs CSKA Moscow; Manchester Utd vs Basle. September 27: Basle vs Benfica; CSKA Moscow vs Manchester Utd. October 18: CSKA Moscow vs Basle; Benfica vs Manchester Utd. October 31: Basle vs CSKA Moscow; Manchester Utd vs Benfica. November 22: CSKA Moscow vs Benfica; Basle vs Manchester Utd. December 5: Benfica vs Basle; Manchester Utd vs CSKA Moscow. September 12: Bayern Munich vs Anderlecht; Celtic vs PSG. September 27: PSG vs Bayern Munich; Anderlecht vs Celtic. October 18: Anderlecht vs PSG; Bayern Munich vs Celtic. October 31: PSG vs Anderlecht; Celtic vs Bayern Munich. November 22: Anderlecht vs Bayern Munich; PSG vs Celtic. December 5: Bayern Munich vs PSG; Celtic vs Anderlecht. September 13: Maribor vs Spartak Moscow; Liverpool vs Sevilla. September 26: Sevilla vs Maribor; Spartak Moscow vs Liverpool. October 17: Spartak Moscow vs Sevilla; Maribor vs Liverpool. November 1: Sevilla vs Spartak Moscow; Liverpool vs Maribor. November 21: Spartak Moscow vs Maribor; Sevilla vs Liverpool. December 6: Maribor vs Sevilla; Liverpool vs Spartak Moscow. September 26: Napoli vs Feyenoord; Man City vs Shakhtar Donetsk. October 17: Man City vs Napoli; Feyenoord vs Shakhtar Donetsk. November 1: Napoli vs Man City; Shakhtar Donetsk vs Feyenoord. November 21: Man City vs Feyenoord; Napoli vs Shakhtar Donetsk. December 6: Feyenoord vs Napoli; Shakhtar Donetsk vs Man City.